Islamic radicalism in Western Europe is generally associated with networks and cells affiliated with global jihadi organizations, such as al-Qaeda, whose ideology calls for the violent pursuit of a global Islamic political order. By most accounts, support for radical extremist groups is relatively low among Muslims in Europe.27 Nevertheless, such groups have been central to the public discussion of Islam in Europe, especially in recent years. Dramatic and violent events perpetrated by jihadi cells, such as the Madrid bombings of 2004 and the attacks on the London transport system the following year, have fostered a growing fear of Islamic extremism among many Europeans and others in the West. But violent jihadi organizations represent only one segment of a broader ecology of Islamic radicalism that includes militants without direct operational ties to any group, as well as nonviolent radicals who disavow the use of force to affect political change, such as Hizb ut-Tahrir. While media and policy elites often lump these various strains of radicalism together, the political logic that drives the groups often varies significantly. The origins of Islamic radicalism in Western Europe can be traced to the 1970s and ’80s, when a number of Muslim dissidents, including some jihadi ideologues affiliated with violent offshoots of the Muslim Brotherhood, were forced to flee their home countries, such as Egypt and Syria, and arrived in Europe. Europe itself was not initially viewed as a battleground for these early jihadis, who tended to focus on struggles back home. During the 1990s, for example, militants from the Groupe Islamique Armé (Armed Islamic Group) in Algeria used France and Britain as staging grounds to organize and raise funds to continue their struggle against Algeria’s secular government. But the 1990s also witnessed the arrival in Europe of a number of radicals with a broader, more global agenda. Some of these ideologues — such as Syria’s Abu Mus’ab al-Suri and Jordan’s Abu Qatada — had close ties to Osama bin Laden and al-Qaeda. Both figures are considered major voices within global jihadi circles, having written some of the most influential theoretical treatises on global jihad and having worked directly with armed Islamist groups in North Africa and Afghanistan. Another key figure is Abu Hamza al-Masri, a veteran of jihadi efforts in the Balkans and Afghanistan, who has lived in the United Kingdom since the late 1970s. 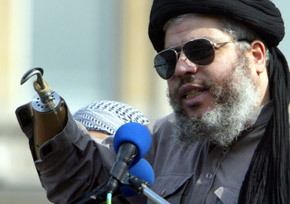 Abu Hamza was the imam of the North London Central (“Finsbury Park”) Mosque during the period in the late 1990s and early 2000s when it became widely regarded as a bastion of radical preaching. Since 2006, Abu Hamza has been in a British prison, convicted of multiple terrorism-related offenses. While Europe had seen sparks of exported foreign conflicts during the 1990s – such as the 1995 Paris bombing linked to the Algerian Groupe Islamique Armé – it was the aftermath of the 9/11 attacks in the United States in 2001, and their connection to an al-Qaeda cell in Hamburg, Germany, that brought wider attention to the question of whether Europe might be serving as a staging ground for global jihadi activities. 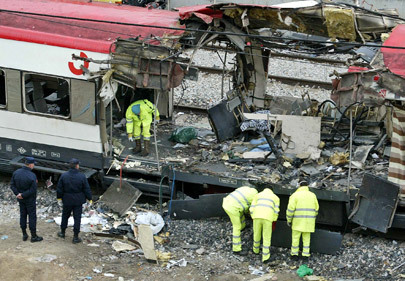 The Madrid train bombings of 2004 — perpetrated by a group of North Africans ideologically inspired by, although seemingly not operationally linked to, al-Qaeda — raised fears that Europe had become more than a haven for jihadist groups and was now one of their targets. 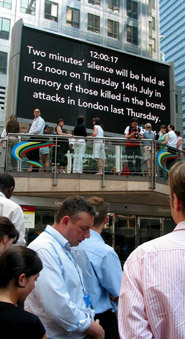 These fears were significantly compounded the following year by the suicide bomb attacks on London’s transportation system planned and carried out by four second-generation British citizens, all but one of whom had been raised in the U.K.
With concerns about the radicalization of Muslim youth on the rise, European governments, starting in the mid-2000s, embarked on a range of strategies to counter this newly perceived threat. In the U.K., for example, significant funds were poured into a wide range of counter-radicalization efforts, such as the Preventing Violent Extremism program, which provides interfaith educational programs and funding for other initiatives aimed at building up the credibility of moderate interpretations of Islam in the eyes of Muslim youth. Limited in scale, radicalization has also proven to be an idiosyncratic phenomenon. In some cases, the individuals involved – such as “shoe bomber” Richard Reid, who in 2001 tried to set off a bomb on a commercial aircraft – have a history of social alienation and involvement with petty crime. In other cases, those involved in violent acts – such as London subway bomber Mohammad Sidique Khan – are highly educated and seemingly well-integrated individuals. organizing and recruiting efforts on the continent in the 1990s. To replace democracy and the nation-state, whose legitimacy they reject, with legal and political systems based on Islamic teachings. militants without direct operational ties to any group, pursue an agenda that calls for the violent pursuit of a global Islamic political order. Nonviolent radical groups such as Hizb ut-Tahrir (“Party of Liberation”) seek to establish Islamic rule through political means. Radical leaders and ideologues who have spent extended periods of time in Europe include Abu Qatada of Jordan and Abu Mus’ab al-Suri of Syria, both of whom have ties to al-Qaeda. Mosque, has been imprisoned in Britain since 2006 for terrorism-related offenses. Another important form of Islamic radicalism in Europe is associated with the Hizb ut-Tahrir movement. Hizb ut-Tahrir (or “Party of Liberation”) is frequently equated with jihadism despite being different from the violent radical groups in terms of its organizational structure, methods and public profile. Founded in the Middle East in the early 1950s as an offshoot of the Muslim Brotherhood, the group seeks to re-establish the caliphate, or “golden age” of Islamic rule, through political means. To this end, its followers reject both the nation-state as a political institution and democracy as a political system. Hizb ut-Tahrir never managed to gain a mass following in the Middle East and was largely driven underground in the Arab world due to hostility from secular regimes touting Arab nationalism. Nevertheless, the group has developed a strong presence in Europe, particularly in the U.K. and Denmark. It also has a significant following in Germany, in spite of being banned in that country since 2003 on charges of anti-Semitism. One reason Hizb ut-Tahrir has been successful in Europe is because it has made an effort to tap into the mixed or “hybrid” sense of identity found among second- and third-generation European Muslims, some of whom feel a sense of alienation from both the Western societies in which they were raised and the Muslim-majority countries from which their parents or grandparents emigrated. Hizb ut-Tahrir’s rhetoric attempts to tap into this sense of alienation by encouraging its followers to view their political identity in global terms, as Muslims struggling on behalf of co-religionists worldwide rather than as citizens of particular nation-states. For this reason, its activities have often been regarded as an obstacle to the assimilation of European Muslims. Unlike many jihadi groups, Hizb ut-Tahrir officially eschews violence, saying it prefers to achieve its goal of a new caliphate through persuasion, protests and political organizing, including recruiting senior political and military officials to its cause. 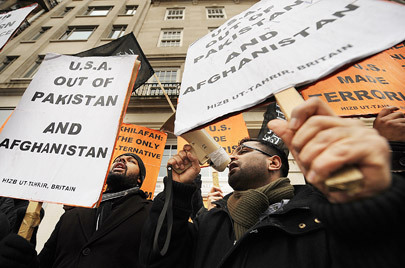 The group frequently organizes rallies and protests, particularly in the U.K., which are usually accompanied by ambitious public statements, such as “Britain will be an Islamic state by the year 2020!” The movement also has sought to take advantage of the suspicions that some British Muslims have expressed about the government’s counter-radicalization efforts.32 For example, the group has published reports linking the British government’s anti-terrorism initiatives to attempts to stifle dissent regarding British involvement in the Iraq War. The influence of radical Islamist groups and movements has been felt throughout the broader Muslim community of Western Europe. The general climate of fear and insecurity prompted by recent terrorist attacks has resulted in considerable public scrutiny of European Muslims, including anti-terrorism initiatives that have raised civil rights concerns among many Muslims. Some radical groups, including Hizb ut-Tahrir, claim that these anti-terrorism policies represent evidence that Muslims will never be fully welcome in the West.